In 2010, three days before Martin Luther King Day, a day commemorating a man who symbolizes struggles for economic and social justice in the US, Haitians experienced a violent earthquake. Reflexes of empathy and compassion prompted people the world over to open their heart in spontaneous gestures of solidarity. This well intentioned momentum was quickly harnessed by political forces intent on controlling the country. These forces took advantage of a temporary state of helplessness and impaired logic to hijack both the political process and the reconstruction funds. In the name of the hundreds of thousands who died that day; in the name of the thousands or maybe hundreds of thousands who made the ultimate sacrifice in struggles for social and economic justice in the US, South Africa... and throughout the world, we respectfully bow our heads and reflect on one of the struggles’ common threads: voter suppression. One of the tools used to subvert the political system in Haiti, voter suppression, strikes a note in African-American populations especially, but also in the overall population. Voter suppression by any means necessary: violence, legal technicalities, or theft, anything that will yield the desired results. Hot war or low intensity warfare, what ever is needed to keep the population in fear. Magical distractions or blatant lies repeated loud and often, identifying the fascist genesis of its practitioners, is another technique. All becomes transparent in a land of contrast such as Haiti. So Haiti is the perfect scene to expose the obscene. Hallowed ground to some, desecrated land to others, but the difference is in the conclusion, not in a confusion of the spectacle. If in the 1860’s the KKK was allowed to define a system of exclusion rooted at first in sheer violence and later in laws, it was thanks to the US government’s refusal to see. If in Haiti a local mafia is allowed to define a system of exclusion rooted in violence and later in laws, it is thanks to US government’s active participation. It is ironic that a US president, son of an African, sends modern day Grand Wizards in lieu of diplomats to represent his government. They wear suits or fashionable dresses instead of the white robe, but the apparent intent is the same: terrorize the Haitian population into submission! 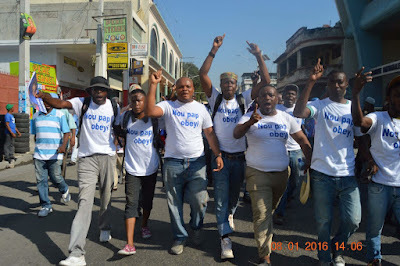 The world knows what happened on election days, August 9 and October 25, 2015, in Haiti. Armed individuals terrorized people, keeping them away while stuffing the ballot box. The UN forces, the police, and the electoral authorities stood by, watched and reportedly participated in the disorder. Worse, they claimed, along with some foreign observers, that these were acceptable irregularities, based on the rationale that a lot of money was spent on these elections. The injustice is blatant and repulsive, yet it is not as shocking as the deeper implications. What happens to the rule of law when laws are ignored? What happens to populations denied the opportunity to choose their political representatives? What happens to young people when they have no hope to change the system through peaceful means? One must conclude that if it does not yet exist, the international community is fomenting a war in Haiti. When we look at the OAS sponsored reconstruction of the oppressive army; when we witness the orchestrated prison escapes of criminals, as part of a denounced plan to create an insecure environment not conducive to electoral campaigns; when we consider that kidnappers caught red-handed have been released to inflict pain on the population, we can only conclude that he who supports such deeds is an accomplice. There still remains the question of the why, but Haiti’s immeasurable subterranean wealth will have to be discussed in another context. Sadly though, the so-called peace promoting organizations of this world are proving to be unable to promote peace. Instead, at least in Haiti, they seem to be very effective at promoting wars. The Mafia state must be stopped in Haiti, and Haitians will stop it. The question which remains to be answered: which side of the war to uproot the Mafia will the US and the rest of the international community take? Dr. Martin Luther King, Jr. is revered today, because his movement for economic and social justice was nurtured by the many who stood in solidarity. In spite of countless acts of barbarism perpetrated by a state apparatus hijacked by an international Mafia, the young people of Haiti offer themselves in holocaust. As historically shown, the sacrifices of the few yield democracy and justice only when nurtured by the solidarity of the many. Nathan Acaau is a Haitian community activist living in exile in the Caribbean.